Close Action Pyro. Turn training events into learning Experiences. Many of these stills, videos and tests are taken from crew positions, not optimal camera positions. Whilst this allows peeping behind the curtain, it does soften the impact. We've included final footage to give a better impression of the real experience. Click on the image above to see the wire guide (removed in post production). The wire allows realistic RPG simulation, firing from one position to another (target) with safety and consistency. The rocket is not carrying a payload, the target explosion is triggered by command wire with line-of-sight by pyro technicians. 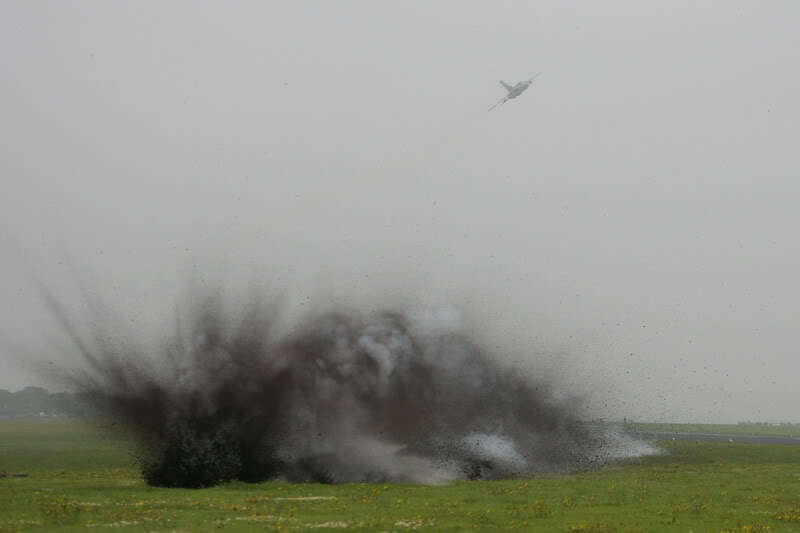 We are able to safely put the flight of the RPG within a few feet of the trainees, and target explosions witin a few metres. Hopefully for most, this training will be as close as they ever come to being under RPG fire. Vehicle strikes, using pyro in the target vehicle and rigs to move or flip the vehicle. Vehicles may be moving, hit it with volley fire and a larger final explosion, flipped or skidded, and a brighter pyrotechnic load delay triggered to simulate ordnance or IED inside being set-off. Whilst movies demand that the RPG flight be seen (as in the tests above), our military training rpg's have faster, less obvious travel lines before striking the target. By changing the composition of the rocket motor we alter the flight speed and smoke track, and with wire guide control we can for instance, fire safely over the heads of trainees to a target they have already passed by. IED set into a burnt out bus. Our design of the explosion creates safe zones allowing personnel to be very close to the action, and for it to be exploded amongst public apartment blocks and shopping streets. The variety of materials used by insurgents and terrorists to manufacture IEDs and range of sizes means that many IED simulation 'event markers' used in training today (gas, or compressed air and powder) do not provide enough depth of experience. Our modular pyrotechnics more accurately match shock, visuals and atmosphere of IED reference material, turning the event into an experience. In conjumction with our sustained smoke, direct fire, RPG and missile strike, etc. the real life experience of IEDs within a tactical piece to halt or hold forces and direct their movement can be replicated in a whole environment experience to support training goals. 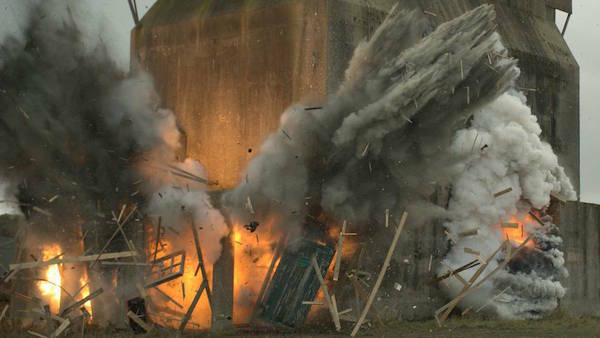 This photo show the breakaway portion added to the building to allow controlled destruction and close approach, and illustrates multiple stepped explosions combined to create the impression of a single large explosion. Our live pyrotechnic suicide vest is worn by and exploded on the bomber, in immediate proximity to the other personnel. It is possible to create fairly large and loud IED effects using compressed air and heavy air receivers as this video shows, but there are compromises on charging time, dressing and hiding of the equipment. An explosion in an alley in Bucharest Romania, showing use of non destructive, close action pyro in the urban, public environment. Crew video of Tornado Jets on a bomb run as part of an RAF role Demo. Using HE and Fuel, we were able to push the heat wave and groundshock to the crowd many hundreds of metres away. To achieve the effects of small arms fire for sound and light only, Agog would recommend and supply gas based gun simulators. 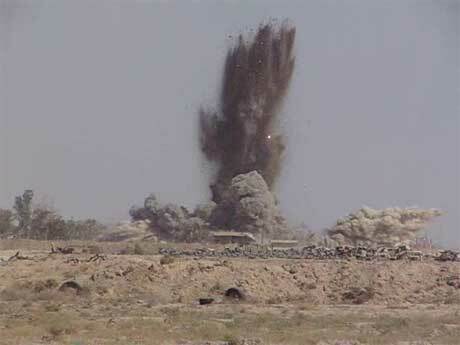 However, larger incident based scenarios (shelling, missile strike, air strike, strategic demolition, truck bomb, etc.) will be better matched to the use of high explosive, ANFO, etc. 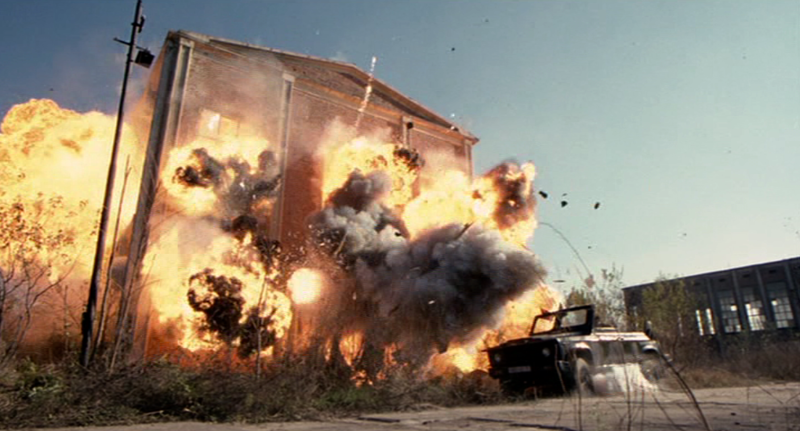 Large explosions can be made safer by breaking down into smaller millisecond-separated explosions, reducing over-pressure effects. Whilst film makers generally add fuel to orange-up and boost visuals, the training simulation should project a more correct visual. Strafing demonstration showing explosions without fireball. This would be a closer match to the visual appreciation of HE in the field, a lot of energy and a lot of dust. 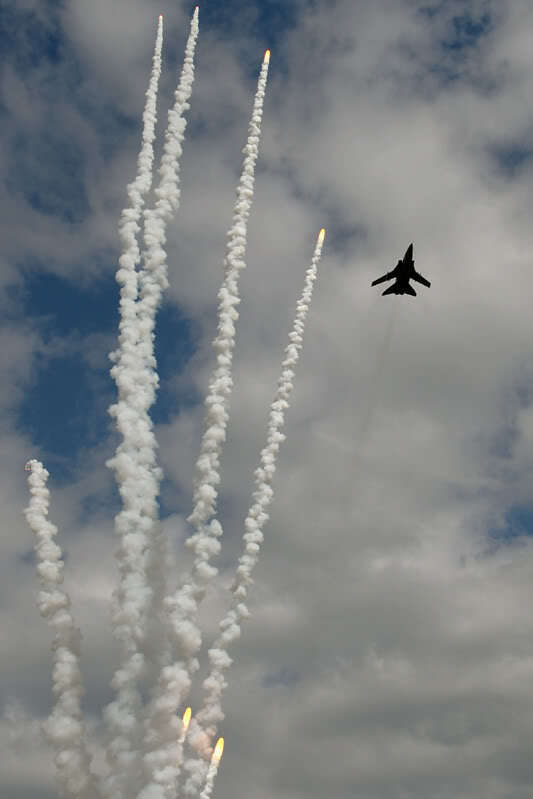 SAM missile launch simulation for Kemble Airshow - an example of an incident-based effect rather than general background skirmish noise. Distant plume of a large HE explosion test (no fuel). Body Hits and Bullet wounds are achieved with small pyro charges on blood bags causing liquid and material from the bag to push out through clothing. Integrating charges, protection and materials together keeps package sizes to a minimum, aiding realism. 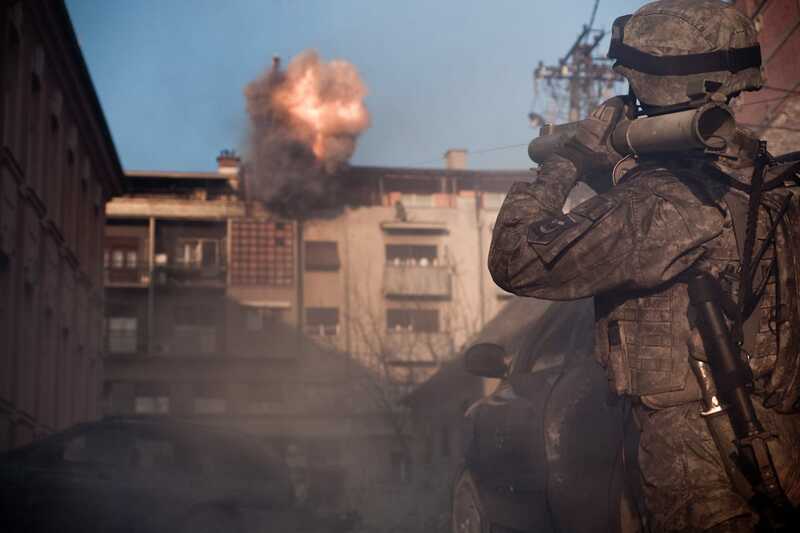 Even small special effects can add an edge to a situation, from keeping trainees pinned down with pre-set micro charges to mimic machine gun or sniper fire on their cover, to a deliberate insurgent shooting of a civilian at a roadside checkpoint, or a hostage when in negotiation. Seeing live bullet wound effects in COEFOR roleplay will undoubtably raise stress levels to near real world experience. More test video, this time of large caliber fire to vehicles, plus HE (no fuel) explosions to mimic missile, smart-bomb or HE, ordnance based IEDS. Another close action casualty bullet hit, this time focused on displaying the exit wound, rather than the entry. These are examples of Agog's techniques and capabilities fully practiced, previously implemented and available, right now. Agog is comitted to demonstrating that the current industry aspirations within military and security training for immersive, realistic learning experiences are already within reach. If you'd like to attend an industry day and experience these effects yourself, please add your details. I'm interested, let me know.